BitRabbit Digital Asset Exchange is pleased to announce that BitRabbit, A MITH official cooperation platform, will be opening MITH/ETH trading pair. 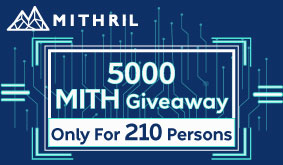 The MITH is open for deposit and on August 16th, 2018, 15:00:00 (AWST, UTC+8) MITH/ETH trading pair will be open. We like to thank everyone for the support and trust in BitRabbit (https://bitrabbit.com). Please be assured that with the emergence of BitRabbit, the era of better digital asset trading and investment has come.